Can Physiotherapy Treat My Jaw Pain? Home > Blog > Jaw Pain > Can Physiotherapy Treat My Jaw Pain? Temporomandibular joint dysfunction (TMD) is a general term that refers to pain and/or dysfunction of the biting/chewing muscles (medically termed as mastication muscles) which are the muscles that move the jaw up-down, side-to-side. What our senior physiotherapists will do in this case is that we will assess the tightness of your temporomandibular joint (TMJ) as well as any tenderness/pain with palpation. We do this to determine if it's the muscle itself has been overworked and developed a sensitive/activated trigger point. If it's truly confirmed that it's a trigger point (see below for more explanation on trigger point; refer to trigger point release therapy here), we will then start the treatment of deep tissue release that seeks to release the tightness of the trigger point. It will usually take 2-6 sessions to resolve this jaw pain, though some patients may need more sessions over a longer period of time. Trigger points are very tight, sensitive and irritable spots in muscles are have very tight and palpable nodes in the muscle fibers. Trigger point researchers believe these nodes to be very tight muscle knots and are a very common cause of pain. Trigger point theory explains that unexplained pain are pain that are referred from other trigger points nearby. If we assess and deemed that there is little to no trigger point tightness within your mastication muscles itself, then the next would be to determine if your jaw pain could be referred pain from the muscles of the face and/or jaw. together, and is located just at the front of your neck. In fact, if your SCM is very obvious, you may be able to see a pair of muscles at the front-sides of your neck that is a V-shape. This is the very same muscle that also tend to get injured/whiplash if you're driving and someone drives into your car from behind. This muscle can be overloaded/overactivated due to early teeth biting and pain from trigger points in this muscle is experienced over our cheeks (a bit similar to sinus pain). If you want to, you can feel/palpate for this muscle by sticking your finger to the area behind the back of your furthest molar teeth. 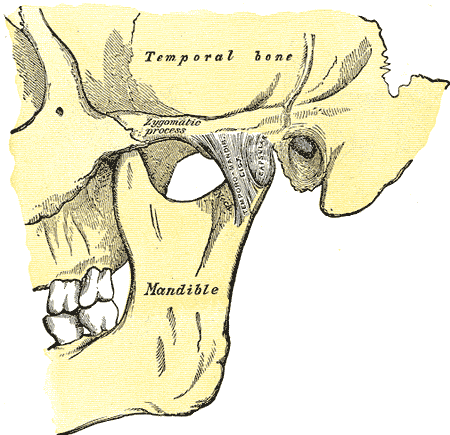 This is also another of our jaw muscle, on the other side of the lateral pterygoid muscle.